Unlike Tamar and Rahab, Ruth is a woman of exceptional character. Her story is one of love and redemption.Traditionally, the book of Ruth is thought to have been written by Samuel, the last judge of Israel but scholars place the writing long after the time of the judges. Ruth is part of a collection of five scrolls read by Jews during their celebration of the Feast of Weeks which corresponds to the Christian celebration of Pentecost. I could write reams about all that the book of Ruth has to teach but for the purposes of this lesson, I will stick to her story. If you’d like to read about the first two women listed in the genealogy of Jesus, click here and here. The time of the judges was characterized by a continuous sin cycle. God’s people would fall into sin and disobedience, then God would allow one of Israel’s enemies to oppress them, Israel would then repent and cry out to God for a deliverer and finally, they would be redeemed and delivered only to repeat the pattern anew. In fact, the book of Judges records the time period this way; “Israel had no king; everyone did as he saw fit.” (Judges 21:25) Scholars place the setting of Ruth’s story during the time of Gideon around 1130 BCE when Israel was being oppressed by the Midianites. ( Judges 6-8) The book of Ruth begins with a famine ravaging the land and Elimelech along with his wife Naomi and their two sons have left their home in Bethlehem in Judah to move to the country of Moab. Moab was located in a fertile but dry plateau east of the Jordan River. The Moabites were descendants of an incestuous relationship between Lot and his eldest daughter (Genesis 19:30-38) that most likely intermarried with the local population in the area. The Israelites had strained relations with the Moabites. They were not to seek a friendship treaty with them as mandated by God because when the Israelites left Egypt and became wanderers in the desert, the Moabites offered them no assistance. (Deuteronomy 23:3-6) They also refused Israel passage through their land on the King’s Highway. (Judges 11:17) Prior to Israel invading Jericho, Moabite women also deliberately seduced Israelite men to idolatry which angered God. (Numbers 25) They primarily worshipped Chemosh and would even invoke his help by offering human sacrifices. (2 Kings 3:26,27)Despite this type of environment, Elimelech moves his family to Moab hoping for a better life away from the famine but unfortunately, life offered heartbreak. Left widowed with no support system or family to care for them, these women were living unprotected and without means of provision. They faced great hardship and adversity. The flame of hope, however, is rekindled when Naomi hears that the famine has ended and that the Lord has come to the aid of his people. They prepare to leave Moab and return to Naomi’s home in Judah. Most scholars agree that Ruth’s name means friend or friendship. She was married to the eldest son, Mahlon, and they had no children. (Ruth 4:10) Scripture is unclear as to the length of their marriage but most likely, they had not been married long. Naomi must have displayed a strong testament to faith in God and love towards her daughter-in-law for Ruth to make this decision. These brave women traveled on a dangerous path towards Bethlehem. The road was unsafe, long, and arduous. They battled climate, geography, wild animals, and people who would do them harm for the promise of what home offered. Naomi battled bitterness and grief due to affliction and misfortune. Given Ruth’s choice to accompany Naomi, I think we can assume that she tried to help love Naomi back to emotional health as well as dealing with her own misfortune. The women finally arrive in Bethlehem at the beginning of the barley harvest in the springtime. Gleaning was a means for the poor to secure food. God had given provision for them through instruction to His people. Acting in his role as a close relative, Boaz provides her with a full half bushel which amounted to approximately five or more days of food for the two women. The amount was very generous and more than a gleaner could ever hope to gather in a day. Ruth continues to glean throughout the barley and wheat harvest. According to Vine’s Expository Dictionary, “the kinsman-redeemer was responsible for preserving the integrity, life, property, and family name of his close relative or for executing justice upon his murderer.” One of the aspects of a kinsman-redeemer was also to engage in a levirate marriage which I talked about previously in the lesson on Tamar. When Ruth told Naomi that she was acquainted with Boaz and was gleaning in his fields, a plan of redemption for them must’ve begun formulating in Naomi’s mind. Ruth followed the bold instructions of Naomi and quietly lay at Boaz’s feet. In the middle of the night, he awakens and discovers her at his feet. Boaz treats Ruth with great honor and respect. Perhaps his heart was tendered by this young foreign woman in a unique way because of Tamar’s background. Boaz gives Ruth six measures of barley to bring back home to Naomi. Boaz might have only been providing above and beyond the law’s requirement to help the poor by sending the six measures of barley by Ruth but perhaps, he was offering a bride price to Naomi for Ruth. Naomi couldn’t legally negotiate a marriage contract with someone for Ruth but given Boaz’s character, I believe the possibility exists that he honored Naomi as head of the family by sending her this gift as pledge for Ruth. Boaz doesn’t waste time but goes to the town gate where the elders of the town gathered and discussed town affairs. He sat and waited for the closer relative to appear and when the man arrives, Boaz requests him to sit beside him. I wonder if Naomi and Ruth were somewhere nearby in order to learn of their fates. Scripture gives no indication that they were in the vicinity. Ruth had every legal right to shame the relative who refused to redeem her by spitting in his face but scripture doesn’t record any interaction between them. (Deuteronomy 25:9) The removal of the shoe, consequently, gave Boaz the right to stand in the other relative’s stead in order to redeem the land and Ruth. The elders along with others at the gate give Boaz a blessing for his new bride and they include an unusual statement to end their blessing. How fitting that they refer to Tamar, a young woman who resorted to inappropriate means to achieve justice and continue the lineage of her dead husband’s line. They gave this blessing based on the value of levirate marriage and how a kinsman-redeemer can bring forth a strong and prosperous line. The tribe of Judah grew strong and prominent under Perez and they wished the same for Boaz. Through this redemptive love story, Ruth becomes the grandmother of the great Israelite king, David, a man after God’s own heart and ultimately, Jesus our true Kinsman-Redeemer. For the full story, read Ruth 1-4. How do I handle bitter circumstances? What do these difficult situations reveal about my character? 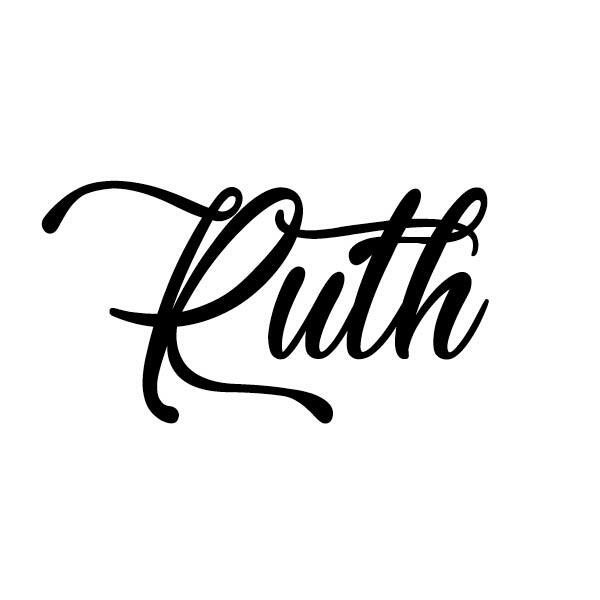 What made Ruth a woman of noble character? Which character traits that she possessed would I like to emulate? Can I learn any insights about building and fostering relationships with in-laws based on Ruth’s example? Do I see any connection between the story of Ruth and its reading during Pentecost? Do I learn and understand more about God’s sovereignty from this story? Do I see a picture of my own love story with God in the story of Ruth? How do I treat or encourage the less fortunate? Do I treat them with dignity?